Business Events at Llangoed Hall01874 754525work Meeting RoomThe conference facilities at Llangoed Hall can accommodate both small intimate meetings and large functions or gatherings. Llangoed Hall makes a stimulating setting for conferences and board meetings, accommodating as many as 85 or as few as four. With several function rooms to choose from parties may easily be divided into separate working groups. Wireless internet access is available throughout the hotel and the three conference and banqueting rooms are unique style, charm and have plenty of natural lighting. The Head Chef, Sean Ballington, has flair and imagination and uses only the finest local produce to create outstanding dishes for delegates. 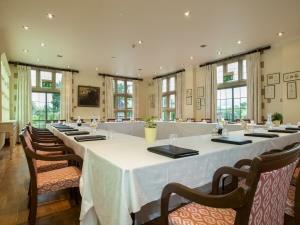 Llangoed Hall is also available for exclusive use meetings and conferences. 24 hour rates from £161.00 to £214.00.